For some reason, a tiny piece of dental floss can strike fear in the hearts of patients. Some of us find it stressful or tough to incorporate flossing into our routines. But once you get the hang of it, flossing isn’t that hard and actually feels great. Ultimately, flossing makes you feel better knowing you reached stuff your toothbrush simply couldn’t get to. The short answer is a resounding yes. 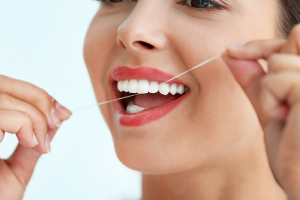 According to the American Dental Association (ADA), flossing helps prevent cavities and gum disease. It reduces plaque by getting to hard to reach spots on your teeth. And there’s an especially strong connection between flossing and preventing gum disease, as gum disease often starts in those hard to reach areas between the teeth that only floss can get to. Flossing only takes a few minutes out of your day, and despite some reports, mouth rinse really isn’t a substitute since it rarely dislodges particles the same way the flossing does. According to the ADA, flossing once a day is preferred, but more frequent flossing certainly won’t hurt. The time of day you floss is up to you. Many people like to floss before bedtime to get any particles that have accumulated throughout the day. But for folks who are too tired at night, a morning or midday floss works just fine. A New York Times article made a splash in 2015 when one expert suggested that flossing first is the way to go, mostly to make sure it gets done. While another expert recommended brushing first so that your floss can help push fluoride from the toothpaste in between the teeth. But the consensus from experts is that the order doesn’t really matter – as long as you’re brushing and flossing, you are well on your way to maintaining healthy oral hygiene. The first recommendation is to take it easy. While thoroughness is important, you don’t need to be too aggressive. Basically, flossing shouldn’t hurt. While it may be a little uncomfortable at first, it should be pain-free once you get the hang of it. You may experience a little discomfort or bleeding gums when you first start flossing, but it should go away. If your gums continue to bleed, you may be flossing too forcefully. Remember to floss gently around the tooth rather than jabbing floss into the gums. If you have questions or concerns, talk to your dental hygienist. New options make flossing easier and more comfortable than ever. Pre-threaded flossers can provide a little extra reach for tough spots. These are great for kids and others who find it tough to get a regular thread into their mouths. Softer, smoother “comfort” flosses glide against teeth and don’t get stuck between teeth the way old school threads used to. The ADA also suggests water flossers for people who have trouble with regular floss or patients with bridges that make flossing challenging. Remember, if you’re struggling with flossing or having trouble incorporating it into your routine, talk to your dentist about some great strategies. Flossing really is a low-tech wonder treatment that you can do yourself every day. If you can remember to brush teeth, you can absolutely remember to floss. Just make a point of incorporating flossing into your routine. You just may wonder how you ever lived without it! For the best flossing tips and techniques, call Hall and Butterfield today to schedule a cleaning.